Prepare for the LEED Green Associate v4 exam with an expert who has been there – and passed! 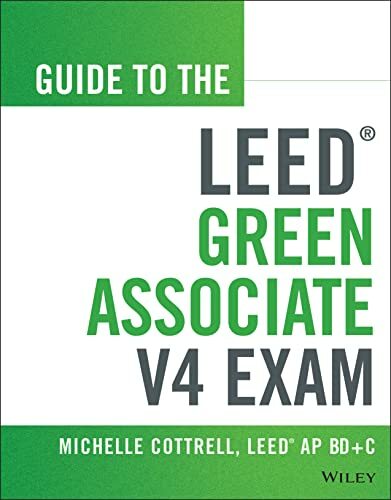 Guide to the LEED Green Associate V4 Exam is a comprehensive study guide for the LEED Green Associate v4 exam. Written by a LEED expert and consultant who actually passed the exam, this guide provides a first-hand account of preparation strategies that work. The book is designed to work with how people study, organized for quick navigation, with sample questions and flashcards throughout. The companion website offers additional study aids, including more sample test questions and flashcards, plus video tutorials that introduce concepts and strategies within each chapter. The book covers all topics and principles included on the exam, and provides all the information necessary to pass. Beyond just providing information, this book offers the insight of someone who's been there, and can manage expectations and eliminate surprises. Motivating, engaging, and packed with expert advice, the Guide to the LEED Green Associate Exam helps eager professionals prepare for – and pass – the LEED Green Associate v4 exam. MICHELLE COTTRELL, LEED® AP BD+C, ID+C, O+M, Homes is President of Design Management Services. She has helped project teams nationwide pursue LEED® certification, including the new North American BASF Corporate Headquarters, ultimately earning double Platinum LEED® certification under both the Core & Shell and Commercial Interiors Rating Systems. She has published 6 books, including the Guide to the LEED® Certification Process: LEED® for New Construction, LEED® for Core & Shell, LEED® for Commercial Interiors, and the LEED® exam prep series. The Guide to the LEED® Green Associate V4 Exam is a motivating, engaging guide to LEED® design, packed with expert advice from one who has taken ? and passed ? the exam. Fully updated with the latest advances in sustainable design thought and technology, this book goes beyond traditional study guides to provide full coverage of the exam topics, plus expert tips on preparing and taking the exam itself. The information is organized clearly, with sample questions and flashcards throughout, and the companion website features additional study aids including interactive flashcards and practice exams. Professionals eager to prove their skills will find the Guide to the LEED® Green Associate V4 Exam to be an invaluable one-stop resource.